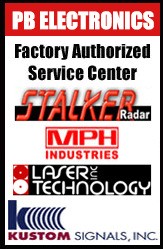 Factory Authorized Service and Calibration Center for Stalker, Laser Technology, and Kustom Lidar units. We have many refurbished units available. We carry the Kustom ProLaser III, ProLaser II, LTI units, Laser Atlanta and Stalker Lidars shown below. Each come with carry case, certification and 90 day warranty. Defying the standards of conventional LIDAR, Kustom's compact, battery-operated ProLaser III offers a new level of performance and features not available elsewhere. Using advanced software and a superior optics design, the unit provides quicker target acquisition and a beam only 3 feet wide at a range of one thousand feet. The ProLaser III's selectable environmental mode minimizes the range-limiting effects of poor weather conditions. You'll experience improved operation in rain and snow — even when aiming through glass or a windshield. It has pinpoint accuracy you can rely on. 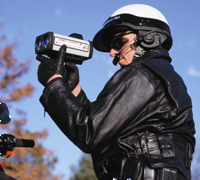 With ProLaser III, speeders simply don't have a chance. The ProLaser III's sleek, compact, ergonomic design weighs just over 3 pounds (with the battery). The unit features a forward swept handle that reduces arm and wrist fatigue, allowing officers to comfortably target vehicles without the use of a shoulder stock or supporting rest.